Welcome to RPJ Book Reviews. Your Online source for new and bestselling Books. CHECK OUT OUR FREE BOOKS SECTION BELOW! Audie, a seemingly typical twelve-year-old girl, is summoned from her middle school one day. She travels through a windmill farm and brought to an island where she’s told that she is actually an Angel and, more importantly, that she is of Phoenix descent. She is the pivotal and final member of an assembly of others her age, called The Angel Army. The army includes Luce—the dangerously handsome dark Angel predestined to fall from Heaven—and Cave—a stowaway from Earth who is crushing on her hard—as well as eight Angels with magical talents, a feisty Fairy, and a nimble gnome. Audie’s ordinary life becomes drastically different as she transforms; she sprouts gold wings, receives a halo passed on from the mother she never met, and her fellow Angels teach her to use her hand-me-down Phoenix powers. However, before she even learns to fly she is told of the real reason she is needed: an evil Elder Angel has discovered a way to dominate Heaven. Haunted by dreams of her past Phoenix life, puzzled by her feelings for both the charming Luce and her human friend Cave, Audie has to conquer her newfound powers quickly because the future of Heaven rests on her wings. Can she fight against flying Dare Demons, the Marsh Master, the Frost Fairy, and Evil Souls to save Heaven? Can Audie change destiny and save Luce from falling to his fate? 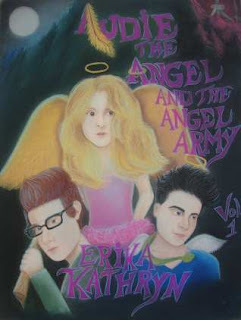 Audie the Angel and the Angel Army is the first of three volumes in a Middle Grade to Young Adult fantasy adventure series that make up The Angel Archives. Hang onto your Halos, because this story is filled with wild winged adventure! Erika Kathryn has her Bachelors of Science Degree from East Carolina University, major in Criminal Justice, minor in English. She's been dreaming of Angels for over 10 years. She started the story of Audie when she was still in college. She has written several other novels and many poems but none of which pull at her heartstrings the way Audie the Angel does. She is currently working on the journey of Volume 2 for Audie the Angel. When she isn't writing Erika Kathryn reads to her beautiful Angel-Daughter, Kathryn Kay, and tells her that dreams DO come true while residing in Crete, IL. Charles Wright’s New Book “Up from Where We’ve Come"
Copyright Romeo D. Piansay Jr. 2012 . Picture Window theme. Powered by Blogger.